JWR offers a variety of new and refurbished compactors: based upon the volume and the material that you are processing, JWR will assist in choosing the correct compactor for you. From a self-contained compactor to a transfer compactor, JWR will help you find the compactor that best meets your needs. 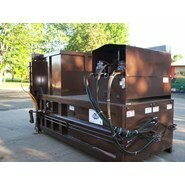 JWR offersa variety of new and refurbished compactors. Based upon your volume and the material that you are processing, JWR can assistyou in choosing the correct compactor for you. The Sebright Precrusher offers a 5” steel wall to crush trash against, and with a resultant ram force rating of up to 74 and 113,100#’s of compaction force, waste material is reduced to a fraction of the original volume. The Precrusher is available with the single 7” cylinder or the twin 6” cylinders on models from the 5260 to the 10660, and is engineered to destroy anything placed into the chamber. Rubbish that tends to have memory is completely crushed before being pushed into the container, making it a good solution for product destruction. The Precrusher function can be by-passed when desired, and the Precrusher and regular compaction can be programmed to run at different force settings. Precrushers are available in a variety of configurations, whether you need to have a free standing unit for loading in the lot with a forklift or pay loader or you need complete security and an enclosure with a drive on deck – plus many other options – Sebright can engineer your installation for your site.